thence by inheritance to the father of the previous owner in the 1950s. This extraordinary Jacobean costume piece, in a near-pristine state of preservation having descended in the same family until 2018, is perhaps one of the most beguiling examples of Flemish émigré artist, Paul Van Somer’s work. He has rendered the young Thomas Dallison’s face with a soft sfumato brush-work in a feat of realism that represents a huge shift from the iconographic mask-like portraits of a generation earlier in Elizabethan England. 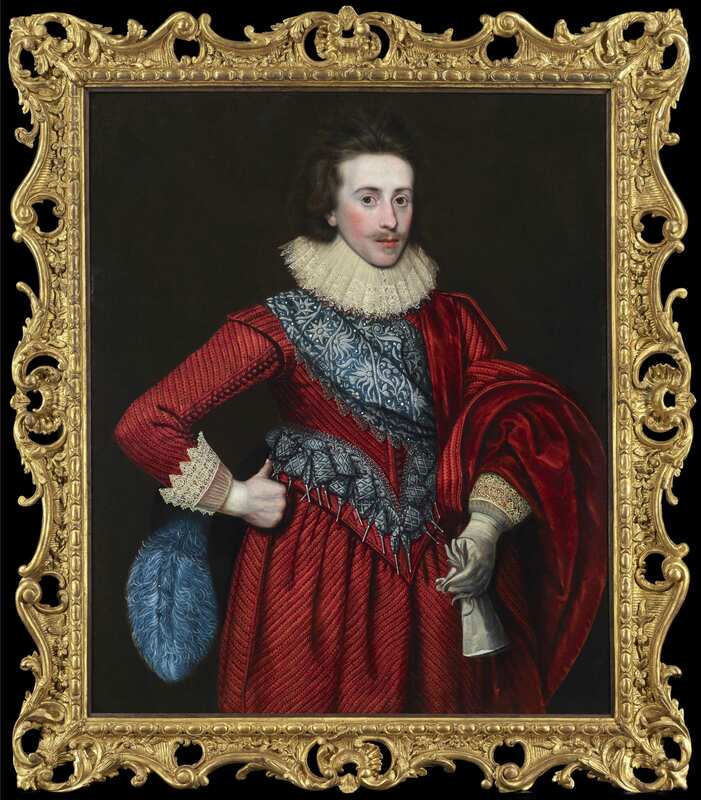 His attention to the sumptuous red silk costume is meticulous and to magnificent effect: Sir Thomas’s accessories are of the highest fashion; from his dropped lace collar and cuffs, to his kid gloves and blue-dyed ostrich plume hat. This is clearly a young man of substance and ambition. Most costly of all are his extravagantly silver-embroidered mantle, and matching embroidered sash, from which dangle expensive silver lace chapes (or ‘aglets’). Sir Thomas Dallison was the son of Sir Roger Dallison MP, 1st Bt. Laughton (c.1562 – 1620), and his second wife Elizabeth Tirwhitt. Hebecame heir to the estate after his elder brother’s death (shortly before their father’s in 1620), and that same year he and his mother petitioned James I to return his father’s manor (Scotton) after it had been used as collateral to repay his father’s debts. It is possible that the present portrait was painted on the occasion he and his mother visited London in Spring 1620 to see his father (who was then in custody). He finally succeeded in obtaining a royal warrant in December 1623, returning goods worth £602 and discharging two bonds of £730 due to the Exchequer. However, in May 1624 his claim to his father’s baronetcy was jeopardised when it emerged that, by a clerical error, the seal for the original grant had been omitted from the register. Secretary of state Sir Edward Conway reported the king’s concern that Thomas’s reduced estate ‘might be prejudicial to the orders of the institution’ but that he ‘would be glad to satisfy him if he could in justice.’ Thomas was therefore created baronet by a special grant in the following October. Dallison was of considerable military merit; appointed a captain of the Royalist army in 1639 and a Commissioner of Array in Lincolnshire in 1642, he was a colonel of the horse under Prince Rupert’s forces. He was killed at the battle of Naseby in June 1645, having never sat in Parliament. Unmarried, he left an estate worth £12,000. Paul van Somer (also known as Paulus), came to England from Antwerp during the reign of James I of England, becoming one of the leading painters of the royal court. As well as painting the king and queen, his patrons included powerful members of the royal circle, such as Ludovic Stuart, 2nd Duke of Lennox, Elizabeth Stanley, Countess of Huntingdon, Lady Elizabeth Grey, Countess of Kent, and Lady Anne Clifford, who referred in her diary to sitting to Van Somer on 30 August 1619. Suprisingly little is known of Van Somer’s Flemish training, especially as he arrived in England as a mature artist. According to Karel van Mander, he was the brother of the artist Barend van Someren, and from 1612 – 1614 he lived in Leiden, and is then recorded in Brussels in 1616, the year he moved to London, where he immediately became court painter. He brought with him a new grandeur and naturalism to British royal portraiture. His much-reproduced portrait of James I in 1616 and of Queen Anne in hunting attire with her dogs, in the grounds of Oatlands palace in 1617, very much established Van Somer’s position as their firm favourite, arguably supplanting John de Critz and Marcus Gheeraerts the Younger. Copies of van Somer's royal portraits were often commissioned to be sent as gifts overseas, particularly as James disliked sitting for portraits. In many ways, Van Somer could be said to have paved the way for fellow Flemish artists Daniel Mytens and Anthony Van Dyck at the British court, much as de Critz and Gheeraerts had made way for Van Somer. Indeed, Mytens settled in London by 1618, where he was Van Somer’s close neighbour in St. Martin’s Lane, Covent Garden. Van Somer is also believed to have been the first to consistently use regalia in royal portraiture, for example the Order of the Garter. Certainly, his work was much sought after for his faithful interpretations of his sitter’s finery.